A contemporary classic, this Accurist chronograph is ideal for a handsome everyday look. This masculine watch features a round stainless steel case, grey sunray dial with black sub dials and rose gold detailing. Fastened with a durable stainless steel Milanese bracelet, this sleek design will add style to your wardrobe. The chronograph functions include 1 second stopwatch up to 30 minutes, 24 hour read-out and date display. 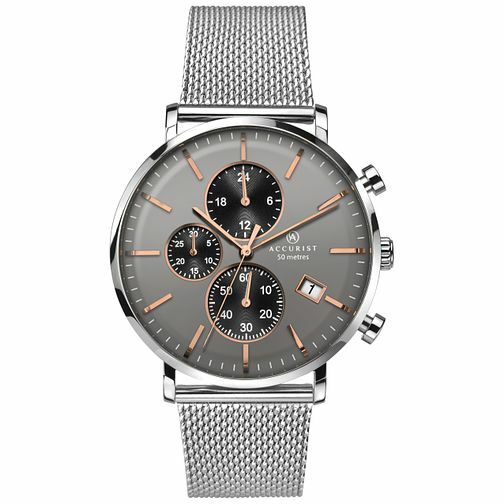 Accurist Men's Stainless Steel Milanese Chronograph Watch is rated 4.0 out of 5 by 1.